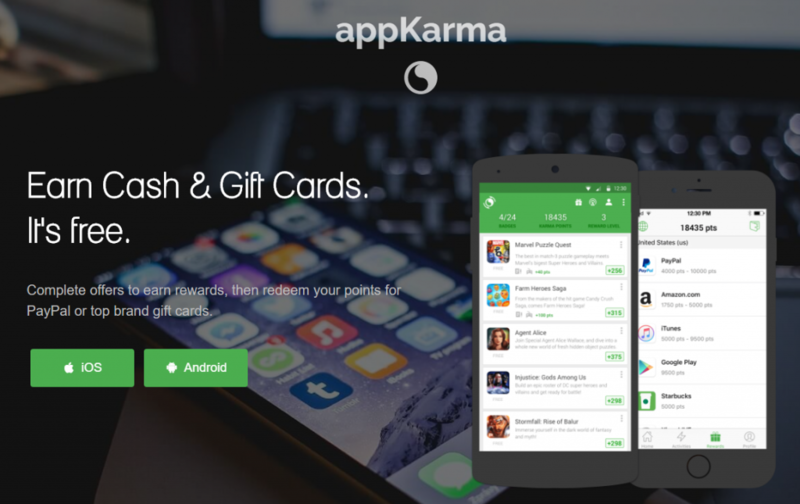 App Karma lets you buy Google Play or iTunes gift cards to yourself, friends and family directly from your iPhone or Android smartphone. appKarma is an app that allows anyone to earn gift cards, no matter where they are. It is a great app for video gamers like you and me that just don’t want to spend real money in their favorite app game. It’s designed for mobile first, but has a web-based version to work from your desktop as well. After downloading and launching app Karma you’ll see a list of all of the free apps that are currently being promoted. Beside each app name is a total point value that tells you how much you’ll earn when you download the app and try it. Unlike other apps that pay you, after downloading and trying an app you don’t have to wait long for your points, they’re displayed on the screen and then added to your balance immediately, which is clearly displayed in the top left-hand corner of the screen. 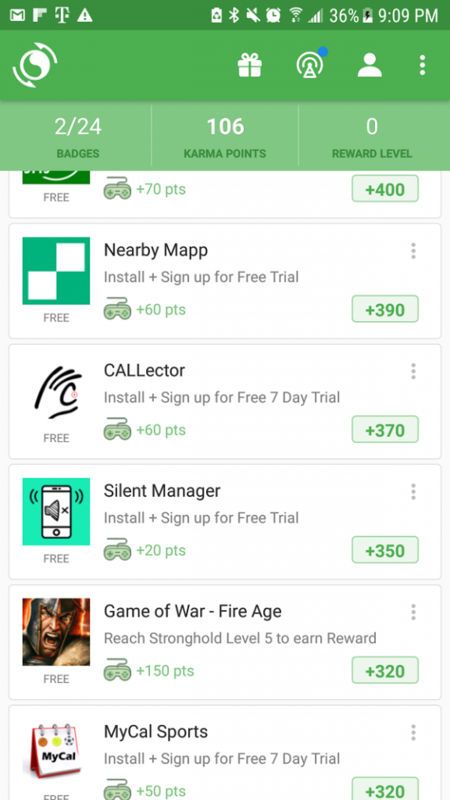 You earn by downloading apps that are listed in the offers tab section. App karma works on a points basis, each app offer gives you a certain amount of points to download said app, which is credited to your account upon completion of downloading and playing with the app for a few minutes. 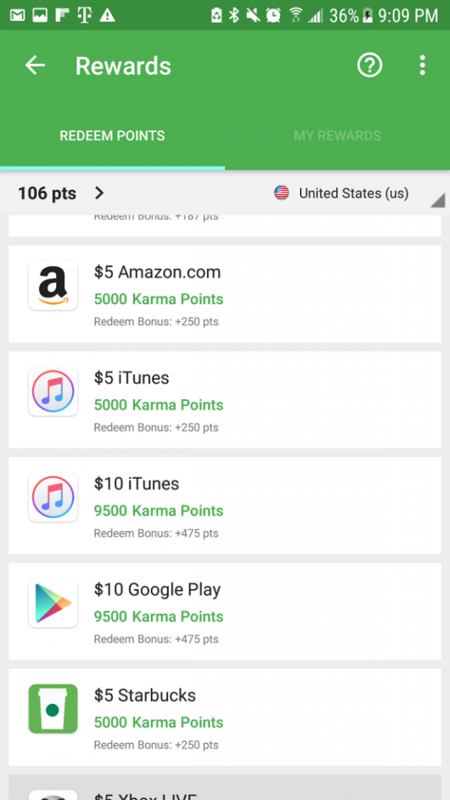 Along with those points you can also earn karma points, which is shown beside the game control icon of each app that offers extra earning points. Karma play points are additional points given if you keep the game on your device for a given period. So let’s say I downloaded SuperLocker- charge faster, I would receive 11 points just to download the app, but I would earn an extra 50 points if I keep the app for 2 more days. To get this extra points the karma play section as a count down timer from the time you download the game to 24 hrs later when you would need to play with the again to earn the karma points for that day. This goes on until the karma play runs out, then you can either choose to keep the app or delete it. You also get 2x karma points when you play with the app the very next day after you download it. So as you can see there are a lot of ways in which to earn. Earn Karma Points by watching videos, completing surveys, searching the web, and shopping for deals. You can earn Karma Points by playing with apps and watching app trailer. If you have a youtube channel, blog, social media account, etc, with a large following you can become an app Karma VIP. As an app Karma VIP you’ll earn 40-50% of your referrals earnings and anyone that uses your VIP link or referral code will receive 400 Karma Points instead of 300. You can also earn extra bonuses by unlocking achievement badges and leveling up. You can also invite friends to share your invite link. Whoever downloads app karma with your link will automatically use your referrer code. You will get 30% of all the points they earn. They also get 300 points when they use your link or enter your referrer code.You can also earn rewards using karma plays. It lets you earn daily rewards for playing with the apps you’ve installed. Install app, keep the app, and play with the app each day to earn daily rewards. It is great for gifting too! Once you’ve logged in, via Facebook or Twitter, you can quickly scroll through your contacts, then choose from over 50 (at present) different partners from whom you’d like to purchase a gift. You’ll have options like Jawbone, 23andme, Netflix, Pandora, Spotify and many more, so that there’s a wide selection of digital gifts, as well as physical ones. There are message options for birthdays, special occasions, congratulations or even something as simple as “tough day”. Once your gift is sent, you can then notify the recipient. They will get a message, within 60 seconds, with your customized greeting. Once they go through the message, they have the option to customize the delivery (for physical gifts) or even choose something different, based on the dollar amount spent.As you might expect, there are social sharing options inside of Karma, so that you can publicly tell someone if you’ve bought them something. They can also publicly thank you. If you’re a bit more modest, you can choose to keep the gifting completely private. It’s a unique twist to gift-giving, and it’s one that I can actually see myself using. I’m the freaking worst when it comes to remembering to snag something, so Karma should help to alleviate the consequences of my forgetful nature.You don’t pay anything to download or use app Karma. Instead, the app developers pay fees to have their apps featured in the listings, this means app Karma can afford to pay you a percentage of their income in the form of gift cards. They state that payment takes up to 72 hours.There are different ways to redeem points you can do so via paypal, amazon gift card, iTunes, Google play, Starbucks, Xbox, PlayStation store or steam.The minimum withdrawal is $3 and that’s via paypal. But I suggest you earn up to 9500 karma for the $10 Google Play or iTunes gift card before redeeming for the best value. Now, time to go earn some 9500 for that free $10 Google Play/iTunes gift card!! !